Born in Northern Ireland, Nick is the offspring of two traditional seafaring families. His father spent most of his adult life at sea and his grandfather on his mother's side was a traditional sailing shipmaster. Brought up in the small fishing village of Ardglass and educated in the nearby farming town of Downpatrick. His early academic achievements could at best be described as average. He did however go on to attend the Nautical College in Belfast, where he graduated top of his year. From there he joined Port Line, the cargo ship subsidiary of Cunard Line and began learning his trade on the UK to Australia, New Zealand run. He obtained his masters "Ticket" in the winter of 1975 and shortly after was offered a position onboard the fabulous Queen Elizabeth 2. This short term contract soon turned out to be almost a lifetime commitment as he remained with Cunard Line for 30 years. 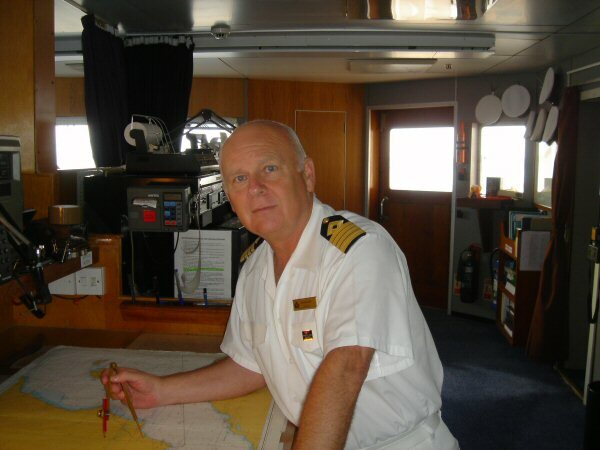 His first command in 1995 was onboard the Cunard Countess, cruising around the Caribbean. Since then, he has also been in command of the Crown Majesty, the Seabourn Goddess II, Caronia and Queen Elizabeth 2. In 2005 he was offered the position as Captain of the Princess Cruise ship, Sapphire Princess and subsequently her sister ship the Diamond Princess, at that time the largest ships in the Princess fleet. As it transpired this move proved to be an excellent training ground and one of the proudest moments in his life when he was appointed Captain of the magnificent Queen Mary 2. He currently resides in Edinburgh with his wife Kefah, he lists his hobbies, among many other things, as Golf (badly), Scuba Diving (warm water only) and writing short stories. His latest book With a Pinch of Salt: A Collection of Nautical Expressions And Other Stories explains in his own unique way many everyday expressions that owe their origin to our Nautical heritage. This is an independent QM2 web-site, and not associated with Cunard Line Ltd.